I enjoy seeing flower girls the most in a wedding. Well, that is aside from the bride and the groom themselves. They are just a delight to see all dolled up in their dreamy and cute flower girl dresses. Some even have the loveliest headdresses to match their dresses. They all look so incredibly adorable, don’t you think? Shopping for flower girl dresses is has always been based on what the entire entourage would be wearing, especially when it comes to color and dress styles. For couples that are willing to splurge, having custom made dresses for all of the bridesmaids and flower girls would definitely be ideal. This is to ensure that the fabric and made of the dress would be uniform. But if you are on a tight budget, there are online shops, such as Angrila, that offers these kinds of dresses for a more affordable price. This off shoulder satin dress is perfect for a garden wedding. Paired with a lovely hat, it also gives off that royal wedding vibe. 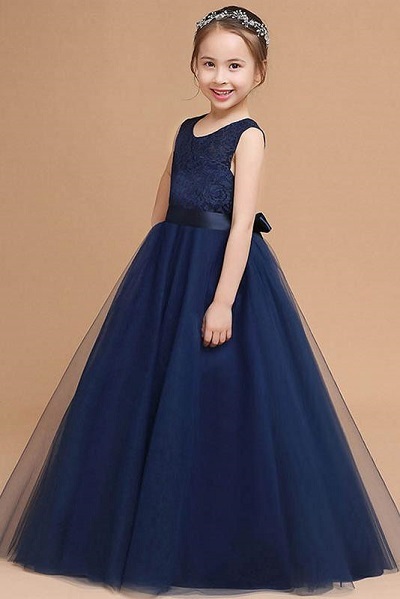 This classy navy blue dress with tulle skirt is modest and perfect for a simple church wedding. It is modest and elegant. For an all out wedding, this extravagant dress is a match for an equally extravagant wedding. The best part is that this dress does not even cost a fortune. Most of the dresses posted here and on their website are only up for grabs for less than $80. Some are even on sale for less than $10. Don't forget to check out their site to see their entire collection. This place is probably my favorite place to organize an event; large enough to fit a good amount of guests and small enough that you really feel like you're having an intimate event. I would suggest these Chicago wedding venues for anyone.